After the seemingly doomed HTC received a nice uplift thanks to its successful One flagship smartphone, it was sure to try to take on the phablet realm. As a result, HTC has announced today its first (real) phablet, the HTC One Max. With a display size that falls right into the phablet form factor, the One Max is here to compete with the Galaxy Note 3. In terms of design and specs, the One Max is just an enlarged HTC One, but the One Max also adds one nifty feature: a fingerprint sensor. Like I said before, the HTC One Max is practically a bigger HTC One. The phone is rather bulky even for its size, weighing 217g and measuring 10.3mm thick. The Galaxy Note 3, in comparison, is significantly lighter and thinner. I think that 217g crosses the line where the device's weight will start making it uncomfortable to use extensively. The back of the phablet is made of the same silver-colored aluminium that made the HTC One so attractive, however, the aluminium cover is now removable. And as if HTC's making some sort of joke, even though the back cover is removable, the battery itself remains non-removable. As usual, the 4 MP UltraPixel camera is positioned in the top-center of the device, and below it is one nifty new addition: apparently in Apple's wake, HTC has decided to include a fingerprint sensor below the camera in the One Max. 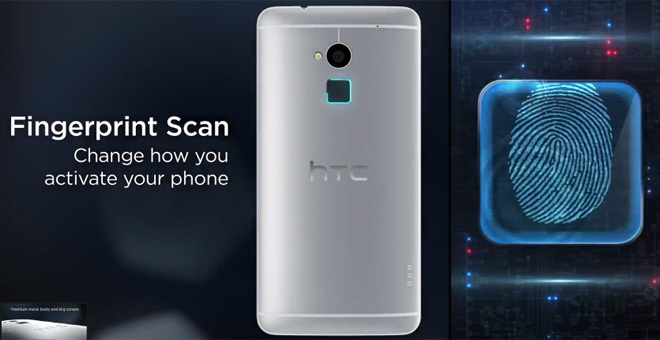 Unlike Apple's solution, though, the fingerprint scanner on the HTC One is activated by swiping your finger on top of the sensor, not just by touching it. In an attempt to take full advantage of the fingerprint scanner's possibilities, HTC has included a nice new software feature, which uses the fingerprint scanner to launch one in a selection of apps of your choice depending on which finger you swipe on it. The front of the device, again an enlarged version of the HTC One's front, consists of two BoomSound speakers located in the top and bottom of the device. The huge 5.9" display has a resolution of 1920 x 1080, equating to a crisp 373ppi pixel density. One big issue I have with the One Max is that, unlike other phone manufacturers, which compensate for very large screens by drastically reducing bezel size, it still has large top and bottom bezels, due to the front-facing speakers, and even the left and right bezels aren't as narrow as the ones found on the Galaxy Note 3 and the LG G2. The combination of a huge 5.9" screen and not-so-narrow side bezels result in a device that may not be so comfortable to hold in one hand. One other complaint I have about the HTC One Max is that it carries a slightly outdated processor. The Snapdragon 600 CPU employed takes a back seat to the Snapdragon 800, which can be found in many of the most recent flagships, including the Galaxy Note 3. It's also noteworthy that the Snapdragon 600 in the One Max is absolutely no match for the Exynos 5 Octa 5420 chipset inside one particular variant of the Galaxy Note 3. It's a very odd decision by HTC, since it has become the norm that a flagship device needs to pack one of the newest SoCs available. In any case, while the HTC One Max's chipset is definitely slower than both the ones in the Galaxy Note 3, it doesn't mean it's slow. The Snapdragon 600 is, even today, a very powerful SoC, and you shouldn't have any performance issues with it in terms of UI and app navigation and even in gaming. The Snapdragon 600 in the One Max should only be a deal breaker for you if you want some serious future-proofing or if you just absolutely need to have the latest and greatest in performance. The HTC One Max should hit stores before the end of the year, but unfortunately there's no pricing info available as of yet. Now, the verdict on the One Max is that: it's a competent contender to the Galaxy Note 3, boasting a very good looking chassis, if not a little too heavy, and it combines a very good camera, a nifty fingerprint sensor, some seriously good front-facing speakers, and a large, beautiful display. You might be bugged by the fact that it doesn't pack the latest silicon, but it still contains enough transistors to provide a smooth experience with whatever you can throw at it. So, if you're on the market for a flagship phablet, the HTC One Max should be near the top of the list, beside the Galaxy Note 3. Non Camera Smartphones & All Android Smartphones Phablets Tablets Review Comments Photos Images & Prices.